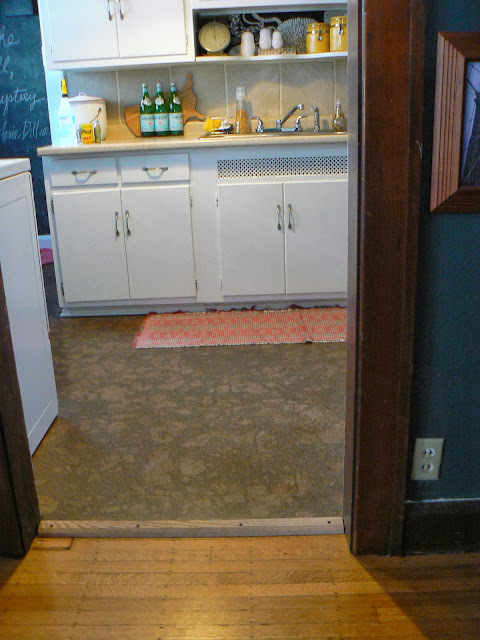 Eight months later and I’m still in love with the cork floors in my kitchen (more on their installation here and here). Seriously, they are amazing. They look great, feel good under my feet, and are easy to clean. If anyone ever asks me how I feel about them, I become a walking infomercial (have you googled ‘cork trees‘ yet? DO. IT. Your mind will be blown). But there was one task leftover from the big install last winter that I never got around to finishing. 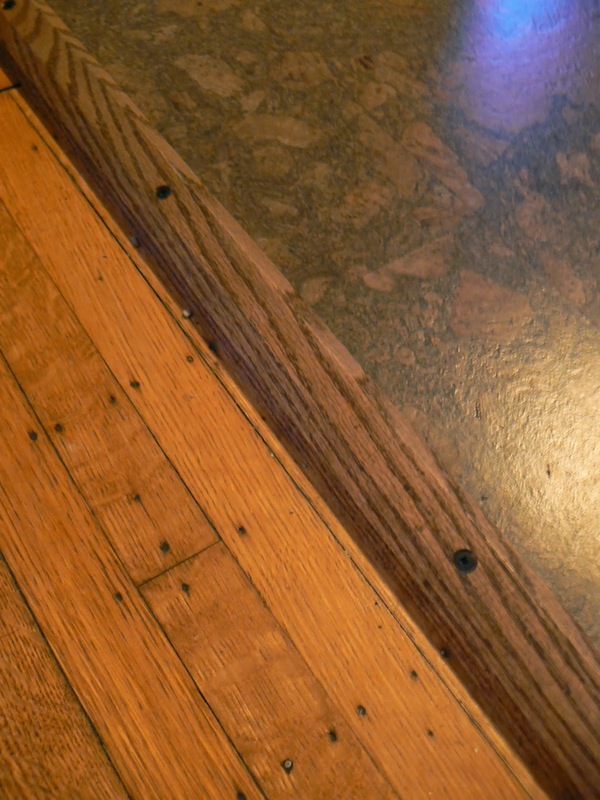 This is the threshold between the kitchen and the dining room. While it was installed perfectly and I’ve never had any problems with it, I never got around to staining it to match the cork. 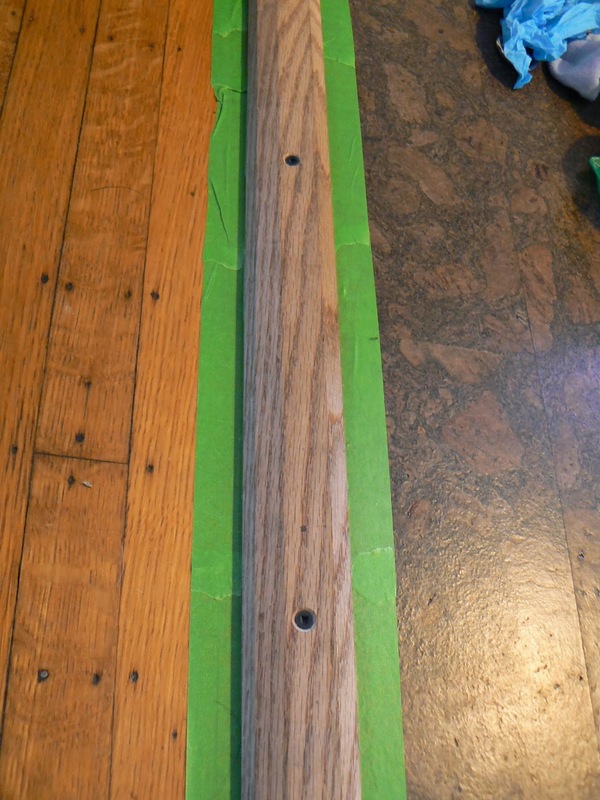 For some reason I was nervous about staining it, which I soon realized stemmed from my last attempt at staining. If you don’t remember, I tried to stain a dresser and it was disastrous (more about that here and here). But after a brief tutorial and pep talk from my friend that helped me install the floors, I was ready to just get it done. I used my good old Frog Tape (more on my preference for Frog Tape here) to tape off the threshold. Since sanding wasn’t necessary, I just put on latex gloves and used an old sock to rub the stain on. I used Minwax in ‘Special Walnut’, the kind of stain without the poly added in (that was my mistake last time). 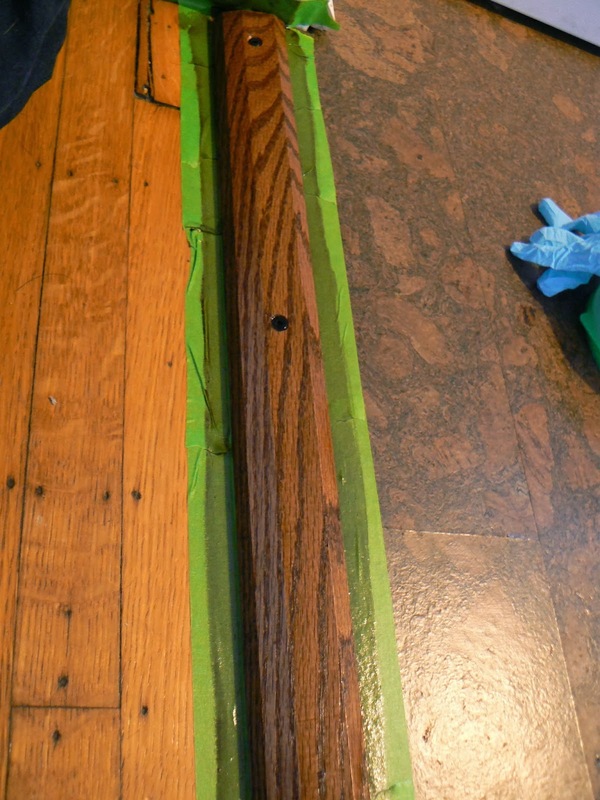 My staining coach told me that if I wanted to make the stain darker I should apply the stain, let it dry over night, and then apply another coat. But if you know me at all you know I am the most impatient person on the planet. It’s like a real problem, so after a few coats I was done. I left the tape on until the next day optimistically thinking I might do another coat, but the next day I was satisfied with how it looked (or too lazy to stain it again, take your pick). It’s a little thing, but it made me happy for a solid week. The transition looks so great now! I should have done it months ago since it only cost $6 and took 15 minutes. C’est la vie!